Cute-as-they-come postcards for sharing – or for keeping! Your ultimate Moshi momento. These chunky postcards are great for cheering up friends or decorating your room. And they even come with an EXCLUSIVE virtual gift! 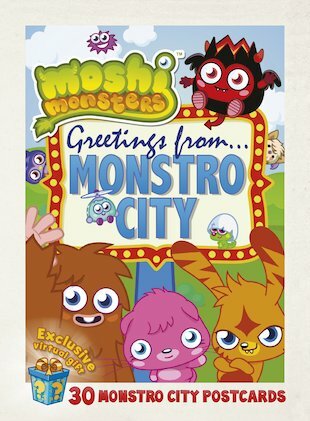 Make your friends jealous with fangtastic ‘Wish You Were Here’ scenes showing all your favourite Monstro City landmarks. Launch a charm offensive with adorable character portraits. Or jive to pop concert pictures of the Fizzbangs in action. Having the most awesome time in Monstro City? Send a postcard home and let your besties know!